Hudson Baby offers fashionable and trendy clothes and accessories for your little one. 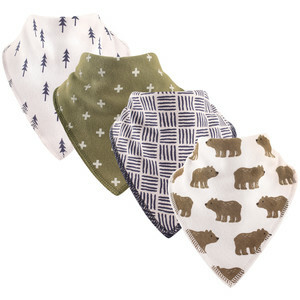 These bandana bibs are super trendy and functional! 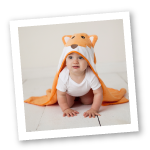 They are made with 100% soft cotton on front and 100% super soft absorbent polyester fleece on the back. This blend of fabric will keep baby dry from drools, dribbles and spills. These assortment of colors and designs are sure to keep your baby fashionable, an exciting upgrade from boring drooler bibs. These bandana bibs have a 2 snap option closure to grow with baby approximately 3-24 months and you don't have to worry about scratchy, irritating hook and loop that babies pull off easily. These bibs are better than just a baby scarf because they're actually functional to catch drools and make all baby's trendy! These are a wonderful baby gift and perfect for your registry if you are expecting a little soon! Since these are affordable, you don't have to worry about having too many! These are also the perfect addition to baby or family photo shoots!